Unfortunately, I didn't get my act together quick enough to launch at the very start of 2015 so I have a "hangover" post (which seems fitting). 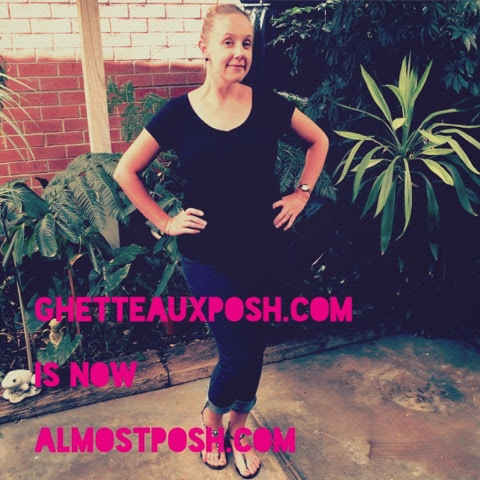 I decided on the name change largely because I was no longer feeling the "ghetteaux" aspect, having moved on physically and emotionally from that space and have chosen a more aspirational title that better befits my current place in life. Who knows, maybe in ten years' time I will rename it to totesposh.com when I'm living the dream in an inner-eastern 'burbs mansion. Also, as Bridie pointed out, any potential brand link-ups probably don't want to be associated with anything ghetto/eaux. Fair enough. So after almost a couple of days of new domain registering, DNS setting updates, username and graphic changes, glitches with hosts and tedious waiting periods, I am pleased to finally post the first Almost Posh blog entry! Content will remain the same, which will be me banging on about shopping and clothes and shoes and lipstick and stuff. And much much more! I suggest you add me to your reading / blog feed list of choice so you don't miss a single word. My Instagram account has also (seamlessly) changed to beth_almostposh so come on over and squizz at my selfies. Thanks Mica! It was super frustrating but happy it has all come together. Your link has reminded me to get inventoring on my wardrobe too. I know I'll be dismayed by the results!